FROM BOLOGNA / PADUA / FLORENCE: take the Bologna ring road and then the exit BOLOGNA BORGO PANIGALE - S. GIOVANNI IN PERSICETO (exit no. 3), turn right on Via Persicetana towards S. Giovanni in Persiceto. After the roundabout go straight until Bargellino industrial area (Zona Industriale Bargellino), turn right in Via Roma, then soon after on the left in Via dell'Industria, until you reach the last buildings on the left. FROM MODENA / MILAN / BRENNERO: take the exit Bologna - Borgo Panigale then go straight until the crossroads towards San Giovanni in Persiceto, then turn left. Take Via Persicetana towards S. Giovanni in Persiceto. After the roundabout go straight until Bargellino industrial area (Zona Industriale Bargellino), turn right in Via Roma, then straight after on the left in Via dell'Industria, until you reach the last buildings on the left. BY BUS: take the bus no. 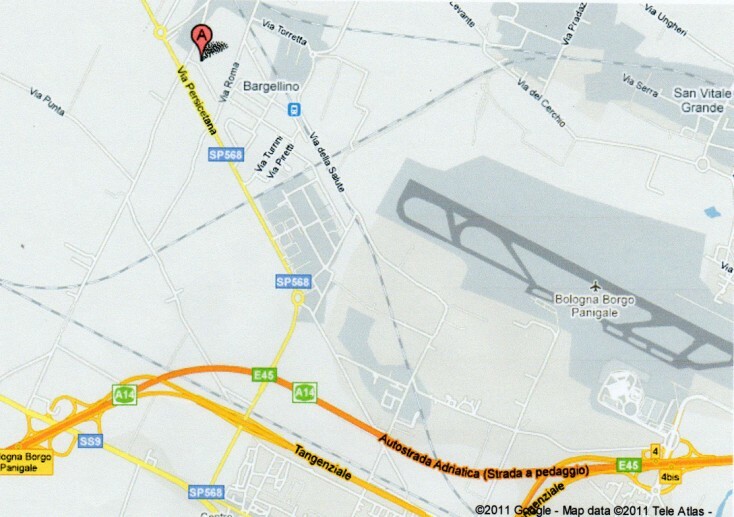 576 to reach the Bargellino industrial area (Zona Industriale Bargellino). You can see our buildings at the bus stop on the North side of Via Persicetana. BY TRAIN: from Bologna Central Railway Station, take the Railway line Bologna - Verona (stop in Calderara – Bargellino station). A train is available every hour to reach our destination in a few minutes.